Oils! You've heard of them, you’ve probably even taken them yourselves, but did you know how amazing they can be for your pets! Oils have been proven to help with joints, inflammation and providing a shinier healthier coat! 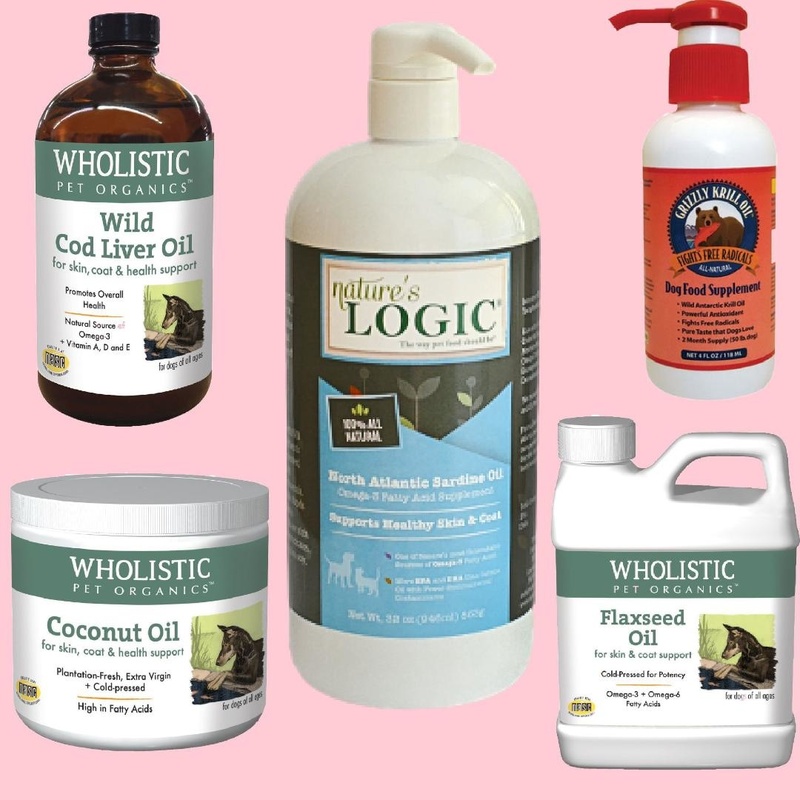 There are many different oils to choose from and your pet can get something different out of each one! But it's always good to switch them around so this way you make sure your pet is getting the most benefit they can. So without further ado, I give you, in no particular order, our five favorite oils! Cold pressed flaxseed oil is incredibly rich in lignans! This makes it a great source for both Omega-3 and Omega-6 fatty acids! This helps to keep cell function efficient and provides necessary boosts to energy metabolism, cardiovascular health, and the immune system! Omegas also help with inflammation in the body and of course help keep fur smooth and shiny! Another added plus is it helps with hairballs. Adding just a ½ a teaspoon to your cats diet everyday can help keep their systems clean of any hairball issues! Coconut oil has so many uses! It helps with nutrient absorption and can even help to break down yeast in the body! It’s full of lauric acid which helps aid health-protecting properties. Coconut oil can also be used topically to heal hot spots and skin abrasions! Because its antibacterial, antiviral, and antifungal it really makes a great addition to any pets life whether its used topically or internally! Cod Liver oil is a great source of Omegas but also Vitamins A, D and E! Vitamin A supports organ function while also keeping your pets immune system working properly! Vitamin D is a great source of calcium which aids bone and joint health! Higher levels of Vitamin D has also been known to fight many diseases including cancer. Then of course we have E which acts as an antioxidant in your pets body protecting cells and keeping out free radicals! What's really great is you’re getting all these nutrients right from the source, nothing synthetic here! One of the best immune boosters around sardine oil also provides a significant amount of vitamins! Another excellent source of omegas, EPA, and DHA! Sardine oil is also full of B3, B12, D, and selenium making it one significant oil! This oil is perfect for arthritis based on its anti-inflammatory properties and dogs with severe allergies! It’s also great for the brain helping puppies with development. Along with many of the other oils on this list it’s great for the coat and another great remedy for hairballs! Krill oil is of course another excellent source of EPA, and DHA! One thing to note is that it contains eight times more antioxidants than any other oil! This helps to eliminate free radicals which aids in your pets digestion! Krill oil also supports your pets liver, ocular, respiratory, cardiovascular, and vascular functions, while maintaining healthy cells and tissues! Instead of being rich in Omega-3’s krill oil actually has omega-3 lipids! Phospholipids assists in nutrient absorption and are a very important element in your pets cell membrane! Overall krill oil is a huge benefit to your pets nutrition! Each of these oils are fantastic in their own way. All of the oils help provide a healthier digestive tract, a cure for hairballs or just a healthier all around system. These oils can be the perfect addition to any of your pets diets!